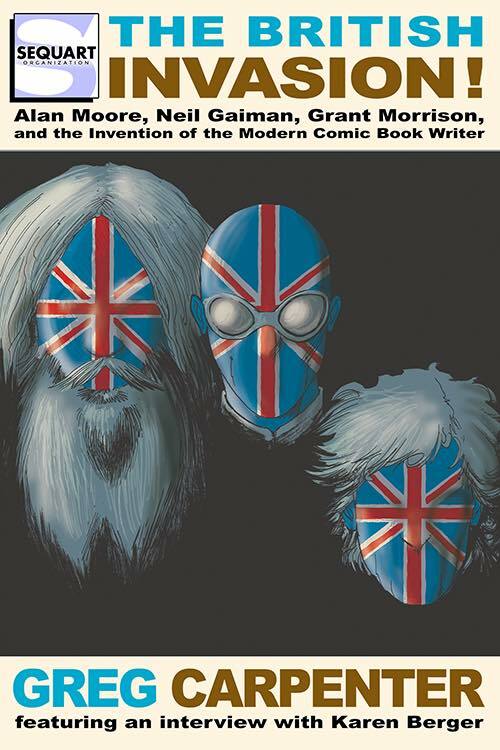 Greg Carpenter’s new book for Sequart charts how a handful of British creators revolutionised American comics in the 1980s, by focusing on three of the biggest names in the medium; Neil Gaiman, Grant Morrison and, naturally, Alan Moore. What was your ideas behind doing the book? Like everyone else who grew up with comics as a hobby that existed on the fringe of society, I’ve marveled over the last few years as comics culture has entered the mainstream. I wanted to try to dig into the roots of that transition. And for me, those roots can be found in the work of the British Invasion writers—particularly Alan Moore, Neil Gaiman, and Grant Morrison, whose careers and interests have criss-crossed with each other for over 30 years. Were you there at the time? What impact did those comics make on you? Part of me wants to say, “Oh, of course not. You know, I wasn’t even born until …” Aw, but who am I kidding? Yes, I was around back then—and almost at the perfect age too. I was a little too young to be on the ground floor for Alan Moore’s Swamp Thing—I was still reading mostly movie tie-in comics like Star Wars, GI Joe, and Star Trek—but by the time Gaiman and Morrison were hired by DC, I had discovered the wonders of Swamp Thing, Watchmen, The Dark Knight Returns, and all the other amazing comics of that time. There was a strong sense with each of their books that we were reading game-changing stories that were redefining the medium. There are moments in history like that—rock music in the late ‘60s, American films in the ‘70s, cable TV drama in the 21st Century—when it’s obvious that history is being made. That’s what it felt like with comics in the late ‘80s. And they had an extraordinary impact on me. I was hitting that age when you really start perceiving the world on your own terms—art, literature, religion, politics—and I felt blessed to have these three voices in my head. In Fun Home, Alison Bechdel talks about the importance of having “spiritual fathers.” Looking back, I feel lucky to have fallen under the influence of Moore, Gaiman, and Morrison. A person could certainly do far worse. There’s a lot more to the British Invasion than those three, why them? And any you wish you could have involved more? Oh there are so many more. As I mention in the book, the British Invasion actually began with artists like John Bolton, Brian Bolland, and Dave Gibbons. And there were several other writers—even in the earliest days—people like Alan Grant, Jamie Delano, Peter Milligan … so many others, not to mention Warren Ellis, Garth Ennis, Mark Millar, and all the others who came after. But when you wind up looking at a 500-page book, it doesn’t take too long to realize that you have to narrow your focus. And in this case, I felt like these three writers, whose careers are so intertwined, gave me the best opportunity to tell the story of the rise of the Modern Age of comics and to look at the evolution of the role of the comic book writer. Similarly, you don’t cover everything by each author. Did you have to cut any favourites? Or least favourites? And if so, why? So I had to leave a lot of things out. Some of those hurt more than others. I had tried to write about Alan Moore’s Neonomicon—a difficult, challenging book—but I wasn’t satisfied with what I wrote, so I ultimately just had to pull it. I also had to pick and choose among Neil Gaiman’s prose fiction. I wound up writing a good bit about The Ocean at the End of the Lane, for example, because I saw it as connected to his comics work, but I had to leave others alone. Perhaps the thing I wanted to write about the most was a Grant Morrison book called Lovely Biscuits. It’s a collection of his non-comics writing, including two of his plays. Since my grad school dissertation focused on drama, I really wanted to take a look at Morrison the playwright, but I couldn’t ever get my hands on the book. (Currently, Amazon’s offering it for around $500.) I tried Interlibrary loan, eBay, and even some desperate pleas on Twitter, but alas. Maybe some day I’ll talk Sequart into releasing a British Invasion “Bonus Disc” with all the extra features. Each writer’s lives connect at points, but are all fairly separate from each other on the whole. How difficult was it pulling it all together into a cohesive narrative? It works really well. Thanks. That was one of the hardest things to do. Moving from one author to the next, trying to cover periods of roughly five years each, but trying to pay attention to the ways in which each of their careers organically fell into phases … it was really tough. Our house is littered with scraps of paper, lists, timelines, outlines, chapter summaries, new outlines … I can feel waves of anxiety just drifting back to those days. You focus on the context of what was going on in the wider world at the time throughout the book. How important was that for you to do? For me, that’s what’s often missing from much of the otherwise good comics criticism out there. Hardly anything ever emerges from a vacuum. Yet, we’ve tended to treat comics that way—as a totally insulated medium that only reflects on itself. Maybe it comes from years of living on the fringes of the culture, feeling like comic books don’t really belong in the same conversations we have about literature, film, television, music, theater, politics and so on. So when I started writing a weekly column a couple of years ago for Sequart, I began with the intention of focusing solely on comics every week. But it didn’t take long before I wound up writing about all sorts of other things—politics, football, Davy Crockett, Broadway musicals, Marlon Brando, the symphony, Stephen King, Westerns, Shakespeare, jazz. If there was an underlying thesis to it all, it was that geek culture is an important part of the culture at large and vice-versa, so we have to pay attention to both. What is your favourite work of each writer and why? With Neil Gaiman, I love Sandman, but as much for the little touches as for the sprawling epic-ness of it all. Can anything compare to “Dream of a Thousand Cats” for sheer delight? I didn’t even write much about that one, but only because there seemed to be nothing to say. It was just perfection. And with Grant Morrison, I think what I love the most are the surprises. I have a nostalgic connection to Animal Man, but as I went through his canon I kept stumbling on lesser-known pieces that were brilliant. In that sense, I think my favorite was a 17-page story he did with Dave McKean called “A Glass of Water.” Sometimes you come across little jewels that simply make you happy that they exist. Why did they make such an impact at the time? Were American comics spinning their wheels? I think the writers and artists from the Bronze Age had done a wonderful job of evolving mainstream comics while still under the specter of the Comics Code. As a generation, the new, Bronze Age creators took comics very seriously—making comics wasn’t just a job. However, by the early ‘80s, the emphasis on continuity and intertextuality was making everything feel a little incestuous. The companies were often catering to the readership, giving them exactly the sorts of things they wanted. But as I always say, we readers don’t really want what we think we want. Instead, we want what we could never imagine. And that’s what creators like Alan Moore, Neil Gaiman, and Grant Morrison were delivering. Can you see anything similar happening again? Every time I get asked that question I always point to the same thing—women in comics. The demographics for both creators and readers are undergoing an incredible change at the moment, with the numbers of women rapidly going up. That kind of sea change can lead to some really exciting things—new perspectives, new aesthetics. When the dust settles, if you’ll pardon the mixed metaphor, the comics landscape is going to be far more diverse and far more interesting. You interview Karen Berger at the end. Her importance to the story and comics in general is colossal, eh? It’s funny because she wasn’t a lifelong comic book reader and she didn’t like superheroes much at all. But she did have a real affinity for high quality genre fiction with a literary bent—writers like Stephen King. That made her the perfect person to be in an editorial position at that time. That middle ground—literary genre fiction—was underrepresented in the comics industry, and Karen Berger’s interests, tastes, and sensibilities were perfect for helping to shape that. If you went back in time and swapped her out for a more conventional comic book editor, then I don’t think we would’ve gotten half the books that finally came out. What’s the lasting legacy of the British Invasion? On a very practical level, it helped popularize adult genre fiction in comics. Creators like Moore, Gaiman, and Morrison claimed a middle ground between the indie comics like American Splendor and the more conventional mainstream superhero books of the time like The Amazing Spider-Man. But in a more profound way, the British Invasion writers also helped remind us that a story ought to be about more than just plot. If the only reason to read the next issue of Batman is to see how he gets out of the jam he was in last issue, most of us aren’t going to stick with it for much more than a year or so. But when the story can deal with more than plot, then reading comics becomes more than just a phase or a hobby. And I’m not talking about simply grafting a social issue onto a story. That’s pretty easy to do, but it’s also formulaic. Instead, I’m talking about comics that speak to much larger, more universal themes. Consider Sandman for instance. Now it’s possible to enjoy that series by focusing on the mythology of the Endless, but what really gives it its kick for me goes far beyond that. Like many of Gaiman’s stories, one of the recurring motifs is the uncertainty of postmodern life—the indefiniteness of things. Mainstream comics often rely on violence as a solution to the dilemmas characters face, but in a world where little is certain, acts of violence—which carry with them a tangible finality—seem a particularly irrational choice. Thus, we often see characters, including Dream, responding to conflicts in alternative ways. When presented this way, the resistance to violence is neither a pat response nor is it preachy. It is, instead, a coherent response to an often incoherent world. If you read enough comics like that, you start to get spoiled. And thanks to writers like Moore, Gaiman, and Morrison, I feel very, very spoiled.